Philly was born out of a desire to build a line-follower that could run my Basement Oval faster than Sandwich. Philly is under construction. Well, I should probably revise that statement. As of Feb 2005, he was under construction, and I got everything working in solderless prototype format. The firmware for the ATtiny26 is rudimentary, I just wrote enough to be sure that my circuit was correct and to prove I could operate the built-in ADCs and also operate 2 motors via Locked Anti-Phase PWM. So then it became time to build a PCB of the circuit so I could install it into Philly’s body and then perfect the software. But since then, my daughter was born and so Philly has been just sitting in a bin in my robot lair. 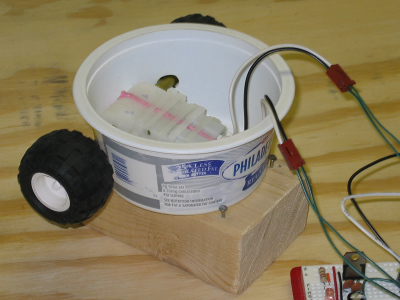 It is now Dec 2006, and I am just getting back into my robot hobby, so Philly has hope yet. As of 5-Feb-2005, his guts are on a solderless prototype and basically done and his body is largely complete also. All that remains is testing of the low-battery monitor circuit, which is only a voltage divider, but I need to test out what ADC value will be appropriate for him to activate the alert. Then I’ve got two other items: 1) minimal body work for mounting the line sensors and motherboard, and 2) fabricating the motherboard which will probably be a homemade PCB but if that frustrates me, then it’ll be point-to-point wiring. 14-Feb-2005: Taking the plunge into homemade PCB construction, I decided to make a prototype board only loosely related to Philly first. 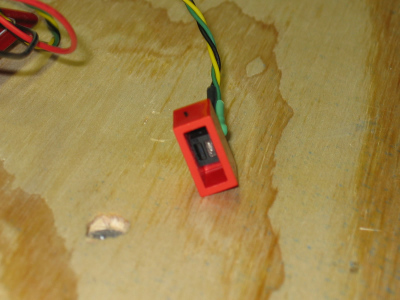 I posted some basic details of my ATtiny26 prototype board. 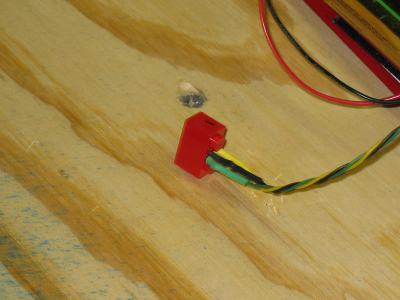 Line sensor made out of a QRD-1114 and a Lego 1x2 brick. I drilled with a pin vise through the top of the Lego block, and ran leads through the holes. Makes a nice compact unit for holding by hand during development, and then can mount easily to a carved-out Lego plate in the robot’s floor. It connects with a Molex KK connector to the motherboard. And a final one upside down, from a strange angle, and the wires are true spagetti. But I wanted to add some eye candy to the page, so here you go. 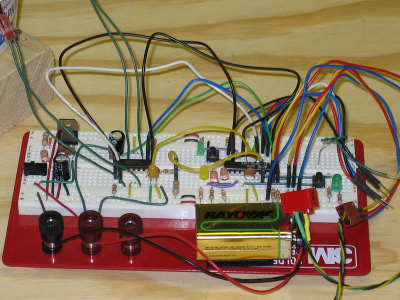 You can see the three major modules (7805 Vreg, ATtiny26 microcontroller, and the motor controller). Philly sitting on his development Throne. He sits on a block of wood so that I can test his motors out without him driving away.